Last week my parish celebrated its feast of title, The Feast of the Ascension, with a lovely sung mass Thursday evening. As the story of Our Lord’s Ascension into heaven was proclaimed in the gospel, the paschal candle was quietly extinguished. After the service was finished, the candle was removed to its normal resting place throughout the year. 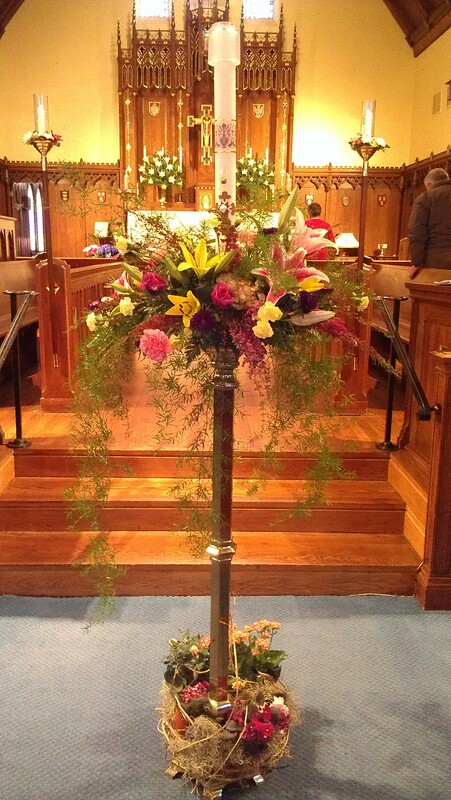 This past Sunday as we gathered to celebrate the 7th Sunday of Easter, the absence of the paschal candle, which has been standing in the same place for the past 40 days, was noticeable. Of course, the candle didn’t mysteriously disappear; it is still in the church, and we will still bring it out for baptisms and funerals, but its light doesn’t shine before us in quite the same way that it did throughout the past 40 days of Easter. Something profound has happened and we can see the change with our own eyes. Before the liturgical changes of the 1960s, seeing the paschal candle extinguished on Ascension Thursday would have been a common occurrence in Roman Catholic and Anglo-Catholic parishes, but in recent times it has become more rare. In the traditional liturgical manual ‘Ritual Notes,’ direction is given that the paschal candle is to be extinguished immediately after the gospel is read at mass on Ascension Thursday. In Dennis Michno’s ‘A Priest’s Handbook’, produced after the liturgical revisions of the 60s, we find explicit instructions NOT to extinguish the paschal candle on the Feast of the Ascension, but to leave it burning until Pentecost. Why this change and why should we care? Admittedly, whether a candle is lit for 40 days or 50 days can seem a pretty insignificant thing, but then it isn’t really about the candle, it is about what our attention is being drawn to, and that is very significant. Symbols are incredibly important, because they are always teaching, even when you don’t intend for them to be. The symbolism of extinguishing the paschal candle on the Feast of the Ascension seems pretty clear: this large candle, a symbol of the Resurrected Christ, is lit (or brought to life) at the great vigil of Easter and it stands in our midst for the following 40 days, just as the body of Jesus was visible to the disciples for 40 days after his Resurrection. Then as we gather to remember the Ascension of the Lord, the candle is extinguished and later moved out of sight. This doesn’t mean that the light of Christ has gone out of the world; what it does mean is that the light of Christ is no longer visible to us in the Resurrected body of Christ, as that has ascended to the Father, but now must be sought elsewhere. Now I am no longer in the world, but they are in the world, and I am coming to you. Holy Father, protect them in your name that you have given me, so that they may be one, as we are one. The Ascension of Christ into heaven is the consummation of all of his redeeming work, because it is then that the human nature that he took at his birth, the human body that he shared with us as his flesh and blood in the sacrament, the body that bore the stripes of his suffering and that died, and the body that triumphed over death: that body has now ascended into God’s kingdom and is now restored to union with God. Our own humanity and our own souls have a place in God’s kingdom because the son has ascended there to prepare that place for us. The world is different for us after the Ascension, and we would do well to take note of it. So to my original question: why the change? In the middle of the last century, there was a trend among liturgical scholars in seeking to restore the church’s liturgy to forms that would have been known to the primitive church of the apostles. One of the products of this movement was a renewed focus on the importance of the Easter Vigil rite and another was an attempt to make the entire period between Easter and Pentecost appear as one cohesive season or one great festival. The “Great 50 days” as it is now known. I will not here go into the merits or demerits of the arguments made by the liturgical movement for Easter being 50 days, other than to say that for Eastern Orthodox Christians the argument has not found a following and their Easter season remains 40 days. One of the changes that was proposed to extend the Easter season all the way to Pentecost (10 days after Ascension) was to leave the paschal candle burning until then. If the liturgical colors and the decorations and the paschal candle were to remain exactly as they were throughout the first 40 days of Easter, then the next 10 will just seem like an uninterrupted continuation of that season. The idea actually worked very well. Too well. If we act like nothing happened 40 days after Jesus’s Resurrection, then that is exactly what people are going to think: nothing happened. In terms of the traditional liturgy, the primary symbol of Christ’s Ascension into heaven was the extinguishing of the paschal candle. When you stop showing people the symbol, you also stop showing people the truth that the symbol is meant to teach. The problem with making Easter one festival that extends from Easter Sunday all the way to Pentecost (regardless of the fact that this may have been done by some in the early church) is that it makes the Feast of the Ascension almost an incidental event between those two festivals. Ascension, which was once a period, has now become a comma and is quickly on its way to being an ellipsis. Our Lord’s Ascension into heaven, as Saints Augustine and Gregory both rightly pointed out, is the culmination of all of his saving work done on earth. The Ascension is his return to living in the presence of the fullness of God, and as we each share in Christ’s body and blood, we who bear his name, so too do we have the promise of living fully with God as well. That is our hope as Christians; that is the goal to which we are headed. Our life is about restoring to the fullness of God that which has been separated from him. That should be the underlying theme to all that we do in this world and the point to which our spiritual lives are directed. We cannot merely skip over the Feast of the Ascension, as if it is just a minor moment in the life of Christ; it is in reality the point to which the entire story of Christ leads. What has become the common practice since the liturgical reforms of the 60s? In many Roman Catholic Dioceses in the U.S., the Ascension Thursday observances were so poorly attended, that bishops began moving the commemoration to the following Sunday in an attempt to at least get the faithful to hear the story, and of course many protestant churches followed suit. Although this is well intentioned, it never quite works out, and in my opinion, usually has the opposite effect. Would we ever consider moving Christmas to the next available Sunday? of course not! The date is too important to us and we always manage to adjust our scheduled to accommodate it, and not the other way around. You cannot expect people to believe something is important, if you don’t show them that it is important. We all know the arguments about weeknight holy days. Here at my parish, which is The Church of The Ascension, the attendance at our Ascension Thursday service is usually a little less than I might hope for, and it is our feast of title, but still it is beautiful reflection on the Ascension of our Lord, and of ourselves as well, into God’s Kingdom. It is also a service that is growing in attendance, not because we have moved it to a different day, but because people can see in our actions and in our liturgy, that something truly important is happening here and we have gathered to bear witness to it. Some would say that the liturgical movement of the 1960s was an attempt to reclaim elements of the church’s liturgy that had been lost or undervalued through time. I would say that that is exactly what I, and many of my priest colleagues who value traditional liturgy are trying to do as well. It isn’t about trying to live in the past, it is about finding in old symbols undervalued and forgotten truths that the future still needs. In the end I am not really concerned with whether or not paschal candles are going to be extinguished on Ascension Thursday by other churches (although I do hope that they will consider it). The candle is not really the issue. The bigger question is whether or not there would be anyone in the church to notice if they did. Thank you for posting this! We celebrated Ascension on Thursday at St Barnabas Chelsea MI. It IS an important event in the life of Christ and the church. Yes, we can move it to Sunday and celebrate it then, but it some ways that can say that church is only for Sunday and not something to be lived everyday. Thanks for this thoughtful, thought-provoking post, Father Kevin. There is obviously cross-over between drama and liturgy, but the tendency to play-act the mysteries of our faith can lead to all sorts of misunderstandings. The irony of the play-acting you suggest is that Luke’s Gospel you read on Ascension Day has Christ’s Ascension not 40 days after Easter Day, but ON Easter Day. NZ Anglicanism, if you have been following my posts, advocates a change in liturgical colour to Red from Ascension Day to the Day of Pentecost. I am totally opposed to such a change. Lent is well understood as a season of 40 days, both in the church and in popular culture. Easter is generally not understood as a season. Ask people when the Sunday after Easter is (most, I posit, will say April 27 2014, not June 15). Ask people when Easter Week is. Ask people when Easter Saturday is. Ask people how long Easter is – the majority will look confused at the question. Certainly, celebrate Ascension Day with enthusiasm and energy. Sing, preach, pray with strong Ascension understanding. Change the tone of singing, praying, emphases in the Daily Office, in these 10 days certainly, just as there is a different tone in Easter Week. But do all this clearly within the 50-day season of Easter. Ascension is not so much saved by putting out and putting away the Easter Candle – that action, in our current church life, only serves to confuse. Christ is Risen and Ascended! Both arguments have merit…I believe The Ascension is losing its impact by the way we celebrate the 50 days of Easter. If Lent can have Passiontide, why cant Easter have Ascensiontide…? Important spiritual and liturgical exclamation marks within a Season…and why not mark them ritually and liturgically or even with a change of color or symbol? I believe that there are two kinds of Liturgists…minimalists which came out of Vatican II (often like terrorists non negotiable) and neo-Liturgists that still want to capture and preserve many traditions dropped by Vatican II without being “traditionalists”. Burses and Veils, color schemes like rescuing black and passiontide red, or Sarum use, litanies and Holy Hours.. Meditation and Tibetan Bells…we have much to reclaim…and little to lose! If we fear neither the past nor the future!. Beautiful article, Robert! And well argued. We at Resurrection always extinguish the Paschal Candle right after the Gospel on Ascension, and no one is confused, I can assure you. When Ascension falls within our school year, we always talk about the Paschal Candle, viz-a-vis Ascension, at chapel. The symbolism of the Ascended Christ is obvious even to a three-year old. Just yesterday I had a priest friend, whose church I was visiting, asked me when we removed the Paschal Candle. I explained it to her and why, and without hesitation, she said, “Well, of course!” and walked right into the church and removed the Paschal Candle. I thought good for her: an open mind, not prejudiced by the militarism of the Liturgical Renewal Movement. And a priest who has never before, through her training and study, come to a position herself, is praised for liturgical appropriateness for removing the Paschal Candle, without consultation with her community, a week after Ascension Day!